Nokia's anticipated Android-powered handset, the Nokia X (also known as Nokia Normandy), has continued to stay in the news, and now new reports indicate the handset has been certified in Indonesia and Malaysia. It is being reported that a Nokia device with a model number RM-980 (previously spotted in a benchmark listing ) has been spotted at Malaysia's certification body , soon after it was noted that the same device had been spotted at Indonesia's certification agency . Recently enough, the Nokia X handset was said to fall under the Nokia's Asha device line-up . Reports state an unnamed senior executive officer from Nokia India, who reportedly also confirmed that the much-rumoured dual-SIM Windows Phone device, aka Moneypenny, would be launched in the country at the same time. Some of the specifications are also rumoured for the handset. The Nokia X will apparently be powered by a dual-core Snapdragon processor clocking at 1GHz. While the precise SoC is not known yet, some previous rumours indicate the handset will feature a Snapdragon 200 8225Q. Other leaked specifications, as shared by @evleaks, include a 4-inch TFT display with a resolution of 480x854 (FWVGA) pixels, 5-megapixel rear camera, 4GB storage with microSD card, 1500mAh battery, 512MB RAM, and dual-SIM support. The handset is said to run a highly customised version of Android 4.4 KitKat also feature Nokia's own application store on board, similar to what Amazon has done with its Kindle Fire tablets. The Nokia X is also rumoured to come with dual-SIM support, while connectivity options including 3G, Wi-Fi, Bluetooth, GPRS, EDGE, AGPS and Micro-USB. Other specifications include 4GB of inbuilt storage and Adreno 302 GPU. Nokia Normandy passes certification in Malaysia now. Nokia Normandy aka Nokia X gets certified in Thailand. Nokia Normandy (RM-980) gets certified in Indonesia - Launch Date Close? 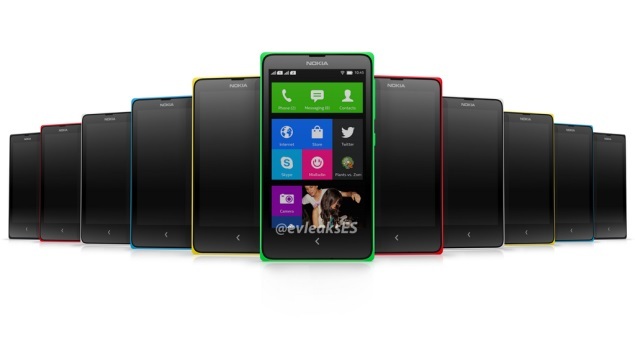 Nokia's Android-based Normandy to be called Nokia X? Nokia's Upcoming Dual SIM Phone Gets Leaked: Is it Asha 504?